Tegenwoordig is een datacentrum veel meer dan alleen een witte kamer met kabelgoten en airconditioning. Een efficiënt datacentrum is een geavanceerde structuur die aan specifieke eisen voldoet; het moet de installatie en het onderhoud van servers vergemakkelijken, met tegelijk een optimalisatie van de energie-efficiëntie. Ons datacentrum in Frankrijk heeft een volledige backbone met de Verenigde Staten. Dit maakt onze shared hosting en reseller hosting product ideaal voor degenen die graag een echt wereldwijd publiek willen bereiken. 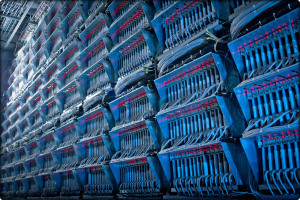 Your website is hosted in our Tier-3 Data center. A high availability network infrastructure, utilizing multiple premium bandwidth providers and with multiple Points of Presence (PoP) in the United States. This Trans-Atlantic backbone guarantees your web hosting products’ low latency and bandwidth quality, wherever you are! To ensure high speed, low latency superior quality bandwidth, our data center has invested in the deployment of its own fiber optics network. 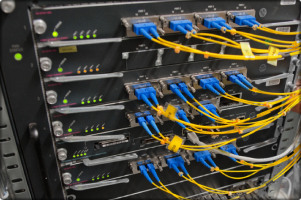 Managed with DWDM equipment.Our network is world-wide in scope. Our routing infrastructure is fully based on Cisco products, due to a privileged partnership. The casings of our servers have been specially designed to optimize installation and maintenance operations. Servers are placed in a chassis that can house up to 36 servers, and new servers can simply be inserted into them which greatly reduces installation time. To guarantee the maximum redundancy and availability of your hosting product, all links are at least doubled at every routing point. Two Cisco routers (each with two network cards) make up the physical connection to your server. The fiber optic cables are at least doubled, and sometimes tripled. 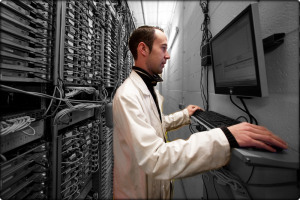 Our data centers are protected 24/7 by a security control system, video surveillance and on-site security personnel. The rooms are also equipped with state of the art fire detection and extinction systems. Our technical teams are on site 24/7, ready to intervene. Hoe zit het met de servers? Al onze servers zijn speciaal geconfigureerd om optimale prestaties te leveren met de nieuwste generatie Intel Xeon-servertechnologie. Voor onze webhosting en Virtual Private Server-producten heeft Woktron servers tot 128 gigabytes geheugen, een supersnelle 1000 Mbps uplink, betrouwbare RAID 10-opslagtechnologie en geoptimaliseerde softwareconfiguraties. We controleren periodiek onze servers om er zeker van te zijn dat ze vrij van misbruik zijn, soepel draaien en beveiligd zijn. We gebruiken geen overselling op onze servers en daarom hebben we een gegarandeerd laag aantal sites per server ratio. We zorgen er ook altijd voor dat we van tevoren meerdere servers toewijzen. Waardoor vertragingen in de configuratie worden voorkomen wanneer de behoefte toeneemt. Het LeaseWeb datacentrum heeft een van de grootste, state-of-the-art netwerken in de wereld, geïntegreerd met 55 points of presence en 33 Internet Exchanges over de gehele wereld. Het netwerk van LeaseWeb levert een enorme bandbreedte capaciteit, hoge snelheid en onovertroffen connectiviteit voor uw workloads. Het LeaseWeb datacenter maakt gebruik van geografisch gescheiden core routers die wereldwijd met elkaar verbonden zijn met alle andere LeaseWeb datacentra en vervolgens met het internet. Het resultaat is een uptime van 99,9999% en een bandbreedte van 5,0 Tbps. U kunt er zeker van zijn dat uw bedrijfskritische applicaties beschikbaar zijn, zelfs in het geval van een onverwachte stijging van gebruik. LeaseWeb maakt tevens gebruik van een combinatie van wereldwijde transit providers en private peering zodat een wereldwijd bereik en hoogstaande connectiviteit altijd gegarandeerd is. What about the servers ? All of our servers are specially configured to deliver optimal performance with latest-generation Intel Xeon server technology. For shared web hosting and Virtual Private Server products, Woktron have setup servers with a minimum of 32 Gigabytes and up to 128 Gigabytes of RAM, high-speed 1000 Mbps uplink, reliable RAID10 storage technology, and optimized server software configurations. We periodically verify our servers to ensure they are abuse-free, running smoothly and are secured. We do not employ overselling schemes on our servers, and so we have a guaranteed low number of sites-per-server ratio. We also always make sure to allocate multiple servers in advance as the need increases, thus avoiding delays in setup. Across 223,130 square feet with 100,000 square feet of raised data center flooring, WDC-01 has been designed to the highest possible standards. This facility leverages faster connections supported by a range of environmental features to provide maximum availability for your data. 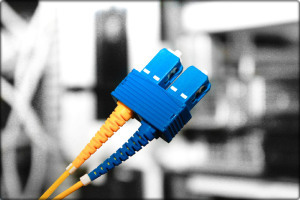 With proximity to government hubs, WDC-01 is home to sensitive data that is served through direct dark fiber connections. This is in addition to the confidential data that may be stored on corporate servers. The security of the devices within the facility is paramount. WDC-01 meets strict federal security standards using vehicle arrest barriers, guarded entrances, biometric access controls, and video surveillance. In addition to being DOD, DCID, PCI DSS and SSAE 16 compliant, WDC-01 is also well prepared for businesses that require FISMA and ITIL certification. WDC-01 is optimized for performance and reliability, with block-redundant electric generation and an entire floor dedicated to additional power and cooling. Even with its exhaustive approach to power, the facility remains a landmark of energy efficiency. WDC-01 has achieved a LEED Gold rating, as well as the 2009 Northern Virginia Technology Council Green Award for work toward carbon footprint abatement. The core features of this green building include a green roof alongside a greenscreen® exterior envelope to reduce wasted energy. Currently, WDC-01 has a Power Usage Effectiveness (PUE) rating of 1.3, translating to a 35% saving over most other data centers. 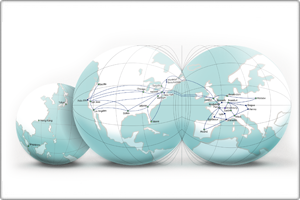 Our West Coast offering includes a unique connection to a redundant worldwide IP backbone comprised of 52 Points of Presence (PoPs), 33 Internet Exchanges (IXs), and 4.5 Tbps of capacity, which is one of the largest networks of its type in the world. “Equinix is a highly reputable company with a long track-record as a data center owner and operator worldwide,” added Schrader. “The strategic relationship with Equinix not only ensures our customers receive secure and reliable data center infrastructure services, it also provides us with extensive channel opportunities by joining their Marketplace and leveraging their vast business ecosystems. to go along with your certificate?